This blog is based on a RadiOAUG broadcast on April 9, 2013 at Collaborate in Denver. 10 Ways to Speed up your Upgrade. 2) Don’t do an in-place upgrade. This allows you to measure the upgrade on the actual machine you’ll use for the production upgrade. 3) Lots of disk space to stage files. Stage the 11i files so you don’t have to clone them before the upgrade. 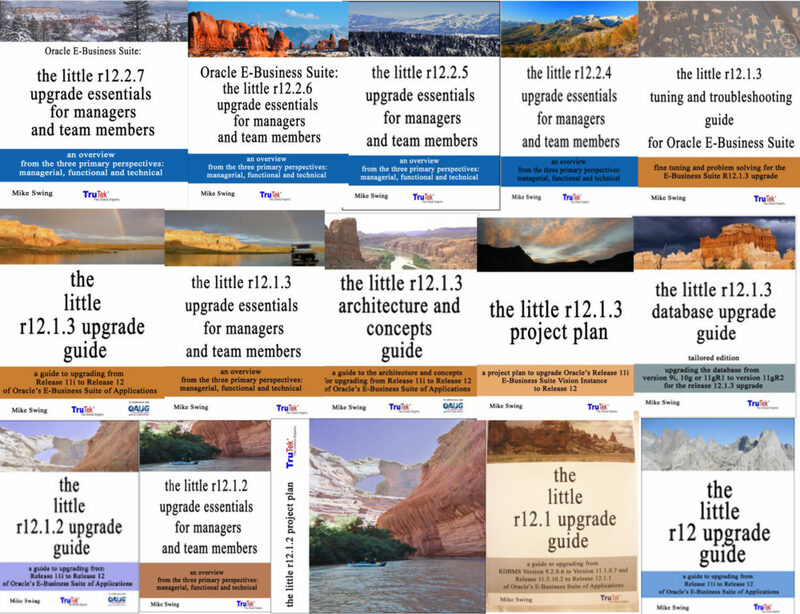 Stage the R1211 files and the post 1213 files, with all the customizations. 4) Try increasing parallel_max_servers to see if this allows greater parallelization. 5) Don’t use a threaded CPU architecture for the database server. 6) If you do use a threaded CPU server, use Automatic Degree of Parallelism (ADOP) to increase the parallelism. There are three modes: Manual, Limited and Auto. We tested Manual and Auto, and had the best results with Auto. 7) XDOLoader – entropy issue. Create a link to /dev/urandom called /dev/random. Note: 1065393.1. Run tkprof on the tracefile and examine the tkprof output. 10) There are lots of functional scripts and datafixes that can speed your upgrade: facpupg.sql and glrsgup2.sql are two examples that allow you to run depreciation in advance and prepare posted journals before the upgrade. 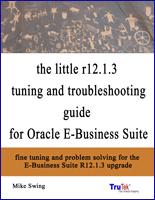 This entry was posted in E Business Suite, Performance Tuning, R12.1 Upgrade, Release 12.1.3 and tagged E-Business Suite, Oracle, oracle performance tuning, r12.1.3, the little r12.1.3 tuning and troubleshooting guide for Oracle E-Business Suite by mswing. Bookmark the permalink.